The Accounting Basics Systems program consists of understanding Balance Sheets, Profit & Loss Statements, Corrections and Adjustments, Accounts Payable, Accounts Receivable, Billing and Posting, Collections, Cost Coding, Bank Reconciliation, Credit Card Entries, Payroll, and Timekeeping. The program advances into QuickBooks training and prepares you for the QuickBooks Certification Exam. The training is hands on and provides use of our on-site Computer Lab and QuickBooks Pro Software. You will learn aspects of QuickBooks including setting up new companies, how to direct deposit, expense accounts and liability accounts. Program is globally recognized and is a requirement of many employers, this ONLINE certificate program provides you with intermediate and advanced accounting duties. Includes advances into many levels of training and skills. Additionally, it includes Balance Sheets, Profit & Loss Statements, Accounts Payable, Accounts Receivable, Costing, Coding, Bank Reconciliation, and much more. You have up to 6 months to complete the program online in Eii’s computer lab with staff to help if needed. Course is self paced and you are able to come and go as you please during office hours. Course includes for a limited time, 365 day QuickBooks 2015 trial software for you to install at home for added practice. Payroll Clerk training consists of learning proper phone skills, gathering payroll information, and types of payroll processing, working with QuickBooks Payroll Software, Tax forms, Basic Payroll Laws (does not include HR laws), end of the year forms, managing payroll information with Microsoft Excel, letters and forms development with Microsoft Word. Course includes 2016 Microsoft Office Training with MOS Certification Exam Training offered through Certiport. Online portion is 5 weeks (200 hours) self paced, and class portion is 2 weeks (80 hours). Program includes online study and classroom study. For online access to the Matrixlms Portal, students must have access to a computer, and they are welcome to take the courses in our computer lab. Students must have Microsoft Word, Power Point, Excel, and Outlook on their computers. Students must have Internet access. Students have up to 6 months to complete the program. 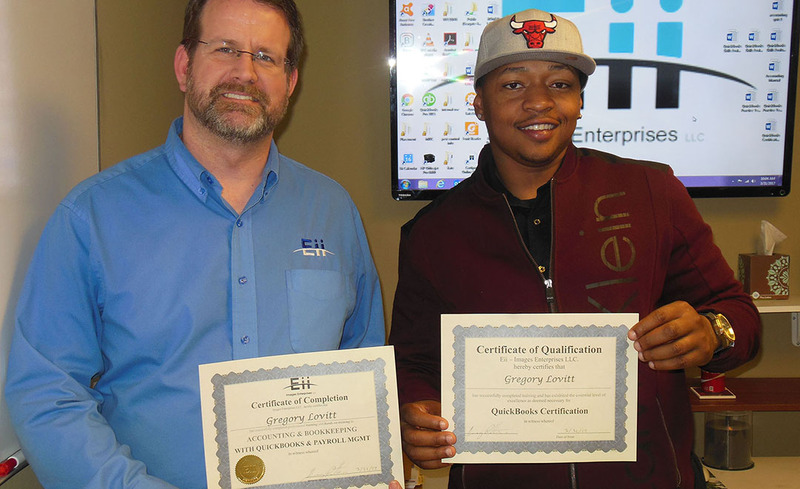 EII training facility is an office testing facility for QuickBooks Certification and MOS Certification. Business and computers are here to stay, program is globally recognized and is a requirement of many employers, this ONLINE certificate program provides you with intermediate and advanced skills. Includes advances into many levels of training and skills. It includes 2016 Word, Excel, PowerPoint, Outlook. You will learn forms, presentations, workbooks, and how to maintain and operate Outlook. You have up to 6 months to complete the program online in Eii’s computer lab with staff to help if needed. Course is self-paced and you can come and go as you please during office hours. Students learn phone etiquette, basic QuickBooks accounts payable, accounts receivable entry, office calendars, customer service, filing, travel arrangements and more. Students will learn Microsoft Office Software (MOS) online, preparing for 2016 MOS Certification, skills of Word, Excel, Outlook, Access. Course includes MOS Exam Voucher for Certification. 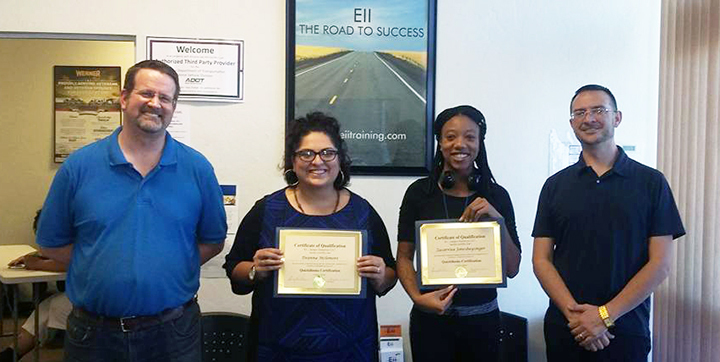 Online training is located in Eii’s Computer Lab with trained staff to help if needed. After online training, Student will advance to 3 weeks in the classroom with hands on training, workbook assignments, in real life situations with the instructor. DEBT FREE IS FREEDOM! With budgeting you can help your company of employment, manage personal finances, help others with theirs, and advance in your career. A person that can do budgets sets them into Accounting Positions for employment. Online course to learn how to build a budget from scratch, how to develop a budget from current events and how to follow and adjust budgets. Course teaches you how to develop reports of cost vs. budget.